The GBP/USD closed positively on Friday on hopes of a delay in the Brexit deadline after PM Theresa May and the European Commission President Jean-Claude Juncker agreed to modify the troubled Irish border backstop in the withdrawal agreement. The UK has no Brexit deal yet, but it could possibly agree on one by the end of March. Traders remain positive as the EU and UK have agreed that talks should now continue as . Today, BoE Governor Carney will be speaking, his comments could spark a short-term volatility in the Sterling. The Pound attempted to break below 1.30 during Friday’s session, but price surged in the last few hours of the trading day and closed at 1.3054. 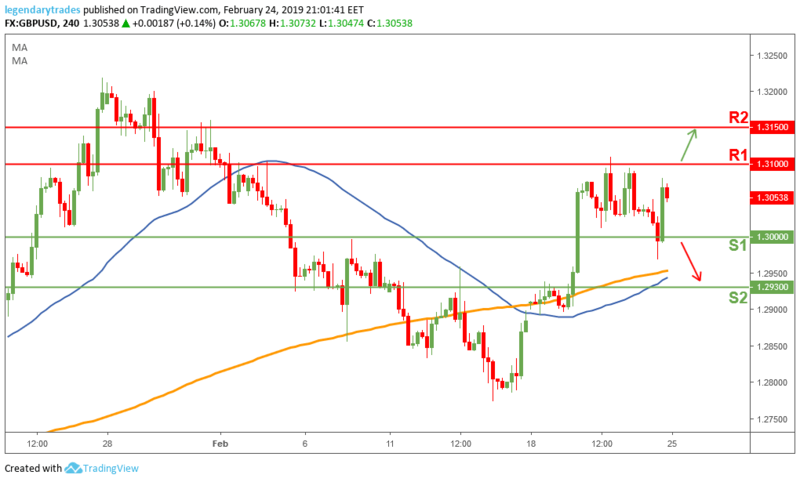 The bias remains neutral until the Sterling breaks above 1.31 or below 1.130 to confirm the next possible trajectory.